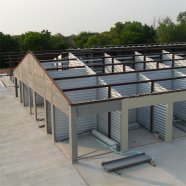 One of the first companies to utilize the grid system, Cannon Storage Systems, Inc. has constructed millions of square feet of self storage units ranging in size from standard buildings based upon a 10'x 10' grid to unlimited lengths and widths. All Cannon Storage Systems, Inc. units are constructed with post & purlin unit designs with 16 gauge red iron with interior partition panels of 29 gauge (available in 26 guage) *Galvalume for long-lasting durability. * Galvalume Is A Registered Trademark. All Cannon Storage Systems, Inc. buildings are constructed from engineer sealed plans by a structural engineer licensed in the build state. Buildings are designed to meet local and state building code requirements. Galvanized framing is available in lieu of red iron for costal areas with high salt content and also for an enhanced appearance especially for open sided boat & RV storage buildings. 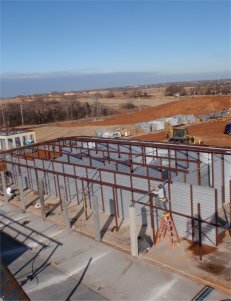 Cannon Storage Systems, Inc. was one of the first companies to utilize a structural pier and header system for the exterior wall framing. Our structural piers and headers are made from 16 gauge galvaneal steel. Piers and headers are available in a smooth prefinished baked on enamel color or with a masonry texture finish covered in more detail on our Exterior Page.